Cape Flattery sits at the northwestern tip of the Olympic Peninsula, on Makah land. Indeed, it is the northwestern-most point of the contiguous United States. For that reason alone, it’s worth a visit. The Cape Flattery Lighthouse on Tatoosh Island. It’s easier to travel to the tip of Cape Flattery than it used to be. A couple of years ago, the rough and pitted dirt road that once lead intrepid travelers 4.5 miles from Neah Bay to Cape Flattery was paved. The muddy, poorly maintained trail to the tip of Washington state was transformed into a groomed earthen and cedar plank trail. The Makah Tribe rightly decided that more people would come to Cape Flattery if it was easier to get there. 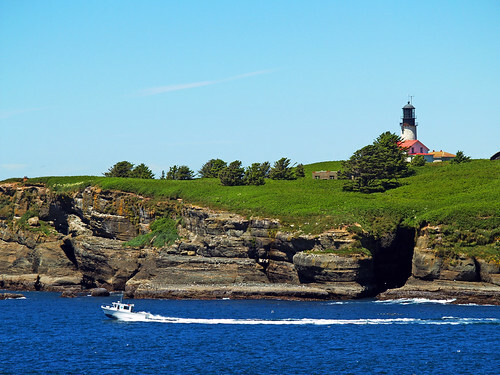 Still, the journey requires a commitment – Cape Flattery is nearly 90 miles northwest of Port Angeles. Once there, it’s worth staying a while. There are several options available. Hobuck Beach Resort on the Makah Indian Reservation offers cabins, RV camping, and tent camping. For more information, please see the Hobuck Beach Resort. You’ll want to have a good supply of Washington State Wines with you while you’re exploring Cape Flattery and Neah Bay. Be sure to allow time for wine tasting on your journey west; there are several Olympic Peninsula Washington Wineries in Port Angeles – right on the way. Wine tasting ensures you’ll be drinking a wine you really like when you’re at the northwestern tip of the contiguous United States.